"Love Action "I Believe in Love"
"Dare" (released as Dare! in the US) is the third studio album by British synthpop band The Human league, first released in the UK on 16 October 1981 then subsequently in the US in mid-1982. The album was recorded between March and September 1981 following the departure of founding members Martyn Ware and Ian Craig Marsh, and saw the band shift direction from their prior avant-garde electronic style toward a more pop-friendly, commercial sound led by frontman Philip Oakey. "Dare" became critically acclaimed and has proved to be a genre-defining album, whose influence can be felt in many areas of pop music. The album and its four singles were large successes, particularly the international hit "Don't You Want Me". The album reached #1 in the UK and was certified Triple Platinum by the BPI. A remix album based on Dare, "Love and Dancing", was released in 1982. 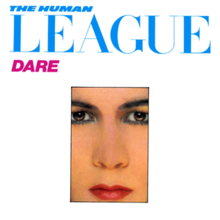 "Dare" is the third studio album from the Human League but differs greatly from their previous two, "Reproduction" and "Travelogue". This is due to a split in the original line up, the subsequent reformation of the band with new personnel and the difference in musical style under Philip Oakey's direction. In January 1981 the Human League consisted of just Oakey and Philip Adrian Wright with newly recruited teenage dancers/backing vocalists Joanne Catherall and Susan Ann Sulley. After the acrimonious split of the original band in October 1980 and the subsequent recruitment of Sulley and Catherall, the new band had only just survived a European tour by bringing in session keyboardist Ian Burden to temporarily assist. The band were deeply in debt and only barely commercially viable. Under pressure to produce results from Virgin Records, original members Oakey and Wright returned to Monumental Studios in Sheffield to start recording demo tracks. They recorded the track "Boys and Girls" from the 1980 tour, which Virgin then quickly released as a single. The style of "Boys and Girls" belonged to the original, now defunct Human League. Sulley and Catherall who were busy with school, were not used other than for publicity. The synthesiser work was basic as Oakey and Wright admitted they lacked the skill of Marsh and Ware. When "Boys and Girls" peaked at number 47 in the UK, Oakey realised that he would need to bring in professional help to take the band in the more pop and commercial sounding direction he wished. Oakey's first move was to invite guitarist and keyboard player Ian Burden from the tour back to join the band full-time. As a trained musician, not only were Burden's keyboard skills vastly superior to Oakey and Wright's but he instantly proved to be an adept songwriter and composer as well. Virgin had suggested that Oakey needed professional production and paired him with veteran producer Martin Rushent, an expert on emerging music technologies of the time. Because of the "unhealthy" atmosphere at Monumental Studios in Sheffield caused by the Human League sharing it with new band Heaven 17 (containing ex-Human League members Ware and Marsh), Rushent moved the band to his Genetic Sound Studios in Reading. In addition Rushent's studios were better-equipped for the type of music the band was making. A downside would be that the distance would cause problems for Sulley and Catherall who were taking their final school exams and had to be bussed down from Sheffield regularly. The first result of their recording sessions was released in April 1981 entitled "The Sound of the Crowd"; it would be a defining moment for the band. With the sophisticated synthesiser work of Burden aided by Wright, Oakey's deep baritone lead vocal and for the first time female backing vocals from teenage dancers (now full vocalists) Sulley and Catherall it would prove to be the band's keystone sound. The final addition to the band would be the experienced guitarist and songwriter Jo Callis formerly of punk rock band The Rezillos, who quickly had to learn the synthesiser. Oakey accepts that Martin Rushent's adept sequencing and programming skills brought a professional edge to the band's sound, and added many new elements and techniques. Oakey, Burden, Wright and Callis set about writing new material, bringing in Sulley and Catherall from Sheffield as often as they were available. The aim was another album for the Human League within a year. Virgin were at this point lukewarm but keen that the band released another single as soon as possible. To set the scene for the album's release Virgin released one of the album tracks immediately in advance of the album. "Open Your Heart" went to number six in the UK singles chart, confirming the band's popularity. Virgin began heavily advertising the release of the new album, set for the end of October 1981. "Open Your Heart" was accompanied by a futuristic looking promotional video, a rarity at the time. Whilst it was still in the charts, "Dare" premiered to critical acclaim. It was also condemned by the Musician's Union, who believed the new technology employed by the Human League was making traditional musicians redundant and a threat to their monopoly. Soon they would begin a "Keep It Live" campaign believing that bands like the Human League would be able to perform concerts at the touch of a button. Virgin executive Simon Draper's next choice would be the track "Don't You Want Me", the conflicting male/female duet about jealousy and romantic obsession that Oakey had recorded with teenage backing singer Susanne Sulley. Oakey was unhappy with the decision and originally fought it, believing it to be the weakest track on "Dare"; for that reason it had been relegated to the last track on the B-side of the vinyl album. Oakey was eventually overruled by Virgin. It would go on to become the band's greatest ever hit, selling millions of copies worldwide and becoming the 25th highest ever selling single in the UK (as of 2007). It was also the Christmas number one for 1981. In 1981 the Human League considered themselves a "song based group"; this was a deliberate distinction differentiating the band from other electronic artists who specialised in principally instrumental work. The writing style of the lyrics is deliberately obscure; Oakey says this is because he wanted the band's lyrics to provoke thought and get people talking about their songs. Often the meanings behind the songs have only been disclosed by Oakey in various interviews given since the album's release. An important point is that the album essentially evolved during 1981 and wasn't written from a single conceptual starting point. The album was a massive commercial success, selling in large numbers, taking it quickly to number one in the UK Albums Chart in early November 1981. It was expected to be the finish to an enormously successful year for the band, but because of its extraordinary commercial success Virgin's Draper decided he wanted yet another single from the album before the end of 1981. By Christmas 1981 "Dare" had gone platinum in the UK, and the Human League had a number-one album and number-one single concurrently in the UK charts. "Dare" would eventually remain in the UK Albums Chart for an enduring 71 weeks. A remix album based on Dare, called "Love and Dancing", was released a year later in 1982. The single "Don't You Want Me" had been released with a very expensive and elaborate promotional video created by film maker Steve Barron. Music video was a very new phenomenon and cable TV station MTV had only just started up to capitalise on this new media but had very little material to work with. Virgin Records syndicated the video to MTV which was played around the clock. Because of the interest the video generated in "Don't You Want Me", Virgin licensed the release in the US of the single and the album. The licensee for the US was A&M Records who renamed the album "Dare!" The addition of the exclamation mark was because A&M wanted to differentiate their (US) release from the Virgin's original release in the UK. The release of Dare! immediately mirrored the success of the UK; and in mid 1982 it reached number three in the US Billboard 200 and the single "Don't You Want Me" was at number one on the Billboard Hot 100. Although critics were not as universally applauding as in the UK, the commercial success of Dare! would set the scene for the band's return to the US charts a number of times in later years. "Dare" earned considerable income for record labels Virgin and A&M; in Virgin's case, it gave the label the first chart-topping album since Mike Oldfield's "Tubular Bells" in 1973. "Don't You Want Me" was the label's first ever chart-topping single. The success of "Dare" was responsible for saving the label from impending bankruptcy. A very grateful Riahard Branson sent Philip Oakey a motorcycle as a thank you present, but Oakey had to return it as he couldn't ride it. As well as the commercial success in the US under A&M, in 1982 "Dare" was also highly successful in Australia, Japan, France and Germany. Dare has been re-released a number of times since its original creation. The cover art and other album artwork is based on a concept that Oakey wanted, that the album should look like an edition of Vogue magazine. The final design is a joint effort between Philip Adrian Wright (also the band's director of visuals) and graphic designer Ken Ansell. Its typography closely resembles the cover of Vogue's April 1979 issue, which inspired the album's title. Oakey is solo on the front cover with Sulley and Catherall on the internal gatefold, and the whole band on the reverse. The artwork has been reproduced in numerous forms for the various re-releases and sold as posters. Explaining why the band's portraits are close cropped and the girls had their hair tied back for their photographs, Susan Ann Sulley explains, "we wanted people to still be able to buy the album in five years, we thought that hair styles would be the first thing to date. We had no idea people would still be buying it 25 years later." Dare was almost universally critically acclaimed in the UK, and featured strongly in the year end polls for 1981. In Melody Maker Steve Sutherland celebrated the fact the album would irritate the guitar-rock traditionalists, saying, "All let's-pretend-pompous it's cornily consistent, cultured, crude, elegant, cheap ... anything you want it to be. Me? I think it's a masterpiece. Sure to upset some, sell to millions more and so it should the way it tramps all over rock traditions. A trite sound, a retarded glam image and a mock respect. All the appeal in the world ... Dare should show up the pathetic farce of pop mythology once and for all." Smash Hits critic David Hepworth called it "chock-full of precise, memorable melodies delivered with style and humour". Noted music critic Paul Morley wrote in the NME, "Dare is the second intoxicating intervention to be produced out of the great split (referring to Ian Craig Marsh and Martyn Ware leaving the first incarnation of the Human League, and their album "Penthouse and Pavement" released with their new band Heaven 17), and already it's the first Human League greatest hits collection ... Much more than ABBA or whoever you like, The Human League signify that deliciously serious, sincerely disposable MOR music can possess style, quality and sophistication ... I think that Dare is one of the GREAT popular music LPs." Martin Rushent received the 'Best Producer Award' at the 1982 Brit Awards for the production on Dare and the success of Dare led to the band winning the award for 'Best British Newcomer'. The album was ranked at #6 among the top ten "Albums of the Year" for 1981 by NME and was voted Album of the Year in the Smash Hits 1981 Readers' Poll. In 2006, British Hit Singles and Albums and NME organised a poll in which 40,000 people worldwide voted for the 100 best albums ever; "Dare" was placed at #77 on the list. The same year, Q Magazine placed the album at #19 in its list of "40 Best Albums of the '80s". In 2012, Slant Magazine listed the album at #86 on its list of "Best Albums of the 1980s". UK Virgin Records V2192 stereo (1981).